SquigglyTwigs Designs: New Things Coming and winner! New Things Coming and winner! Thank you very much for giving me helpful criticism on my blog. You will begin seeing changes in my photography in the coming days. The Critique Time Contest Winner is....Sprouting Flowers, name and claim your prize. I've emailed also. I'm still not a professional, but hopefully the photos will begin to look like I am. ;) I can assure you the patterns are of high quality. Even though I'm a beginning photographer, I'm not a beginning seamstress or designer. Also, a few people (not just on the blog) commented that some of my patterns look similar to those from other places, even in free tutorials. Yes, that is probably so, but every pattern designer writes in a different manner. Tutorials, in general, are not written to be full explanations of how to create a garment. They are generally "stories" about how "I" made "mine". My patterns are written in a special way. My intention is to help a new or "ready to step away from tradition" seamstress learn new and easier techniques for accomplishing a stylish garment. I want to teach others that sewing can be fun, quick, easy, inexpensive, and still look good....and even fit! I tell people I meet that if you can make break and bake cookies or boxed mashed potatoes, you can sew my pattern. I'll even help!!!!! And, you'll learn something in the process. Thanks again for helping me learn and improve the blog! Now....for the new things coming. We've made a few things that we are going to put on here for sale. They are all limited stock. 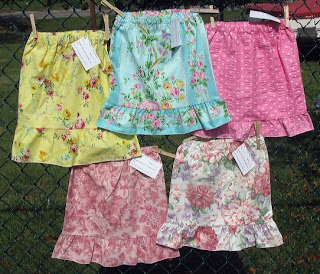 In our store section, you will soon see and be able to buy, little girl's skirts, two types of flower hair clips, sequin headbands, and iron-on appliques. Our focus is still patterns, but we've made some of these things for craft shows and decided to offer them to our readers as well. Watch for tomorrows Tuesday's Tute....it's a skirt that you'll love! Hint: get out some old jeans and your scrap box. We'll also have a "Follow Me" winner.